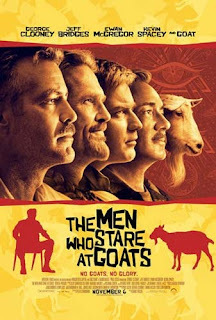 Based on Jon Ronson's book The Men Who Stare at Goats and his BBC documentary The Crazy Rulers of the World, this movie tells how the United States military, demoralized by Viet Nam, set out to create a new kind of soldier. Turning to new age philosophy and the paranormal for inspiration, a special unit code-named Project Jedi was created. The unit was involved in a great deal of goofiness such as trying to walk through walls and stop the hearts of farm animals with the power of the mind. It also led to the creation of a fairly nasty hand-to-hand combat weapon called "The Predator" that looks like a harmless piece of plastic, and most infamously to the use of music like the Barney theme in the torture and interrogation of Iraqi prisoners of war. These facts are weaved into a fictional story in which reporter Bob Wilton (Ewan McGregor) inadvertently runs into “Jedi” Lyn Cassady (George Clooney) while on assignment in Iraq. Cassady allows Wilton to accompany him on what he claims is a secret mission. As the two men get in and out of one scrape after another, Lyn tells Bob how the Jedi unit was started by Viet Nam veteran turned new age space cadet Bill Django (Jeff Bridges). Cassady was the most promising member of the unit, much to the chagrin of fellow “super soldier” Larry Hooper (Kevin Spacey). Eventually, Lyn reaches his objective and we learn the final fate of Project Jedi. The film begins with the statement "more of this is true than you would believe". Unfortunately, more has been changed or omitted than I would have liked. Like, for starters, an actual point of view. The movie tries to have it both ways, showing Lyn and his fellow Jedi as delusional buffoons one moment, and as the real deal the next. It also tries to whitewash some of its characters by blaming the more controversial techniques that came out of the project on breakaway members who had turned to “the dark side”. This timidity dulls the film’s efforts at satire considerably, turning what should have been a biting indictment of military madness into a light-hearted romp. As far as light-hearted romps go, it's an entertaining one, and there's no doubt the cast is great. So check out the movie for a few laughs, and then check out Ronson's book or documentary for a few more laughs as well as some disturbing truths. I don't know, I think goats might do a better job than some of the senators we have these days.